The Parish Council owns and maintains the playing field and groundmans store on Twyford Road, and maintains the changing facilities. Regular football matches are played by several teams including Willington FC. Availabilty of the playing field. The Parish Council owns and maintains the tennis courts. 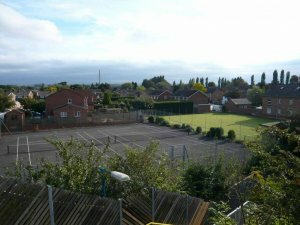 They have recently been restored, which included the resurfacing of the courts, replacement of the nets, posts and fencing. This was partly funded by a grant under the Derbyshire Aggregates Levy Grant Scheme (DALGS) from the Aggregates Levy Sustainability Fund (ALSF) raised by the Aggregates Levy. If you would like to play tennis on the courts, then please contact the clerk who will confirm the rules of use and provide a key. There is also a club ran for children throughout the summer months. Details of which are also available from the clerk.